The Pahrump Junior Trojans Wrestling team traveled to Las Vegas for two tournaments over the weekend and placed well in both. They went to the Rocky Mountain Nationals which was in Las Vegas on Saturday and on Sunday the team was in Henderson at Green Valley High School for the Battle in the Desert tourney. At the RMN they had 32 states represented at this tournament. The Rocky Mountain organization travels from state to state holding nationwide tournaments. 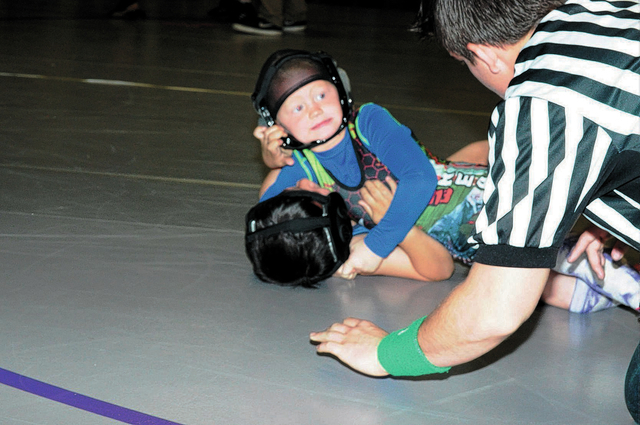 Junior Trojans wrestler Gunner Cortez received first place in the 8 and under 54-pound division and Donald Davis also took a first place in the 6 and under 49-pound division. Coach Ray Cortez was excited for those that traveled to Las Vegas. “This was just awesome for Donald and Gunner. Gunner took home a three-foot trophy,” he said. On Sunday the team placed second overall out of 19 teams at Green Valley. They also placed third out of 19 teams in total number of pins with 33 pins. “This was just huge for Pahrump. We competed against teams like Gorman, Green Valley and Faith Lutheran there,” Cortez said. Cortez is the new head coach for the Pahrump Junior Trojans Wrestling team and plans on making some more changes this year. Cortez traveled with the kids in the past to regional and national tournaments and now Pahrump has all-American wrestlers in the club. “My son, Gunner Cortez and Darren LeGrand, Dylan Wright and Angel Pinzon are all-American wrestlers. They have gone to the state finals and placed in the top three. They have gone to western regionals and placed and then gone to nationals, where if you place in the top eight at a USA National Wrestling tournament you are considered an all-American wrestler. These boys have done this multiple times in the last couple of years,” he said. One of the goals for the team is to be at the top. “This year we are shooting for third in the state. Of course we want to be number one, but Green Valley was the Nevada State Champions last year and is tough,” the coach said. Cortez hopes to bring his kids along and coach the kids all the way through middle school. He hopes as the years pass the team will get some recognition and more kids will become interested in middle school wrestling. “I also coach Pop Warner Football and I plan on using this as a feeding program for the wrestling program,” he said.